See the addresses of our Kitchen Showrooms in Brentwood Essex and Little Aston The Midlands. I start by saying a big ‘Thank You’ to our valued customers over the last 40 years. 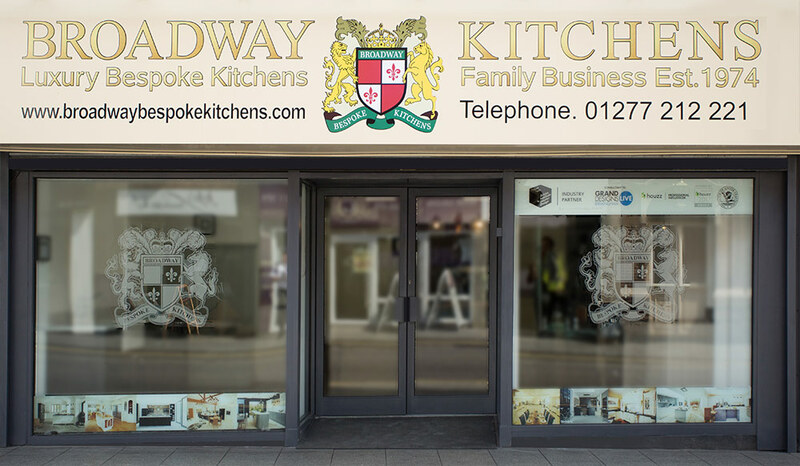 They have helped Broadway Kitchens to become a household name for luxury bespoke kitchens in the Midlands, London and the Home Counties and the rest of the UK. Like many real kitchen manufacturers we are back to the business levels of better times and doing especially well in high-end luxury kitchens in London and around the South East. This success is largely due to our in-house design and manufacturing capability for traditional handmade kitchens enabling us to meet the precise needs of London based customers. Of recent we have designed, manufactured and installed luxury bespoke kitchens in Chelsea, Dulwich, Sutton in Surrey, Dartford and Chigwell. We are particularly proud of the substantial bespoke solid oak Edwardian kitchen we created for a customer in Highgate in North West London. Having our carpentry workshops outside of Greater London means lower overheads make it easier to manufacture more-keenly-priced luxury fitted kitchens for London customers. This does not mean that we do ‘cheap’ kitchens, in fact we claim to be the best high quality manufacturer of classic bespoke kitchens, at the cheapest price in London (in fact the whole of the UK) and I’m not ashamed to say that. In fact we wouldn’t have so many complimentary testimonials if there was any shred of doubt about our service or quality. SEE our Testimonials page. It is perhaps unfair to single out London as the major contributor to our continued success over four decades because we have price-conscious but discerning customers all over the UK. Wherever a customer is based we can usually beat any genuine like-for-like quotation and recommend that customers shop around for alternative quotes as it always highlights our value for money and the shortcomings of any would-be competitors. SEE our Price Promise Charter – which indeed applies to luxury bespoke kitchens in London. We can create a bespoke kitchen that will suit your taste, needs and lifestyle whether your choice is for a highly-detailed Victorian kitchen to suit your Victorian London home, or the understated elegance of an Edwardian kitchen for your Edwardian London home, or the simplicity of a Shaker kitchen or handmade painted country kitchen for any period of home, a or an ultra-modern floating kitchen. We can visit you at home in London first for a free no-obligation kitchen design consultation lasting between 30 and 45 minutes. No sales pressure, no obligation, if you like what we say and we like your ideas then we can arrange for you to visit us at one of our showrooms in Essex or The West Midlands to further explore your aspirations of a luxury bespoke kitchen to suit your London home and begin to turn your dreams into reality. So why not call us for a free initial consultation and take the first step toward acquiring your very own high-end luxury kitchen at a very affordable price. Even though we don’t expect customers to support a highly-priced kitchen showroom in Mayfair, Chelsea, Richmond or Kensington London or a string of franchised showrooms around the country we do have an elegant showroom easily accessible in the heart of England in Little Aston - just 2 hours or so drive up the motorway. If necessary we can arrange overnight accommodation, at no cost to yourself, then collect you from the hotel to visit our showroom where you can see first-hand what quality and wow factor really means and provide you with your design consultation. We can, with prior notice, arrange for prospective customers from London and the South East to visit real kitchen installations in the homes of our many customers. SEE some of our recent Case Studies. You can even visit our factory in The Midlands to see traditional craftsmen at work putting care and pride into every part of a customer’s kitchen. We would welcome you and your family to inspect every aspect of the way that we do business. After all, how many companies can claim to be run by the original founding family members of a business grown from humble beginnings in 1974, spanning over 40 years of success, now joined by Sunny as the third generation of the same family. Our knowledge, craftsmanship, skills and attention to detail as kitchen designers and manufacturers with an absolute conviction to customer care are again being passed from father to son. It is a popular misconception that London is the birthplace of bespoke fitted kitchens. Nonetheless it is fair to say that London like many major trading ports such as Dover in Kent and Liverpool in Merseyside were the gateway to the Victorian and Edwardian influences of Europe and the Americas. Free-standing furniture was popular throughout the globe and such fashionable unfitted kitchen furniture followed the style of the rest of the house. It was only really with the advent of the range cooker patented in 1868 in America that kitchen furniture started to evolve from unfitted to fitted kitchens. Wealthy merchants and Victorian industrialists living in the ports themselves and building their own homes in the surrounding counties of Kent, Essex, Suffolk, Middlesex, Surrey and Hertfordshire started to insist on a room equipped and designated for cooking, hence the bespoke kitchen emerged. A luxury fitted kitchen was yet another expression of wealth and status. The same can be said for population settlements along the major trade routes from the south eastern to north western ports. Influences of bespoke fitted kitchen furniture from around the globe met and mixed in London, The South East, Oxford, Wolverhampton, Birmingham, Stoke-on-Trent and Manchester. Today we see a similar pattern, particularly in London which, as a world-renowned centre of finance, is the home to investors and financiers who invest in their luxury lifestyle. Like their industrious predecessors Londoners like to display their own material achievements through re-creating the opulence of Victorian kitchens, the understated elegance of Edwardian kitchens, simplicity of Shaker kitchens or modern kitchens containing every current kitchen gadget. A good luxury bespoke kitchen designer can create a masterpiece which is fully functional for today’s needs whilst turning the customer’s dream into reality and echoing the styling clues of the property from whatever era from Regency and Georgian through to today’s futuristic minimalism. One-upmanship larder or pantry units and plate racks designed to show off the trappings of stylish bygone Upstairs/Downstairs days now stand cheek by jowl with American fridge freezers and integrated microwaves set in bespoke cabinetry and hand painted cupboards. Often the subtle application of gold leaf on the ornate corbels, pediments and pelmets adds an extra sparkle to a luxury fitted kitchen. 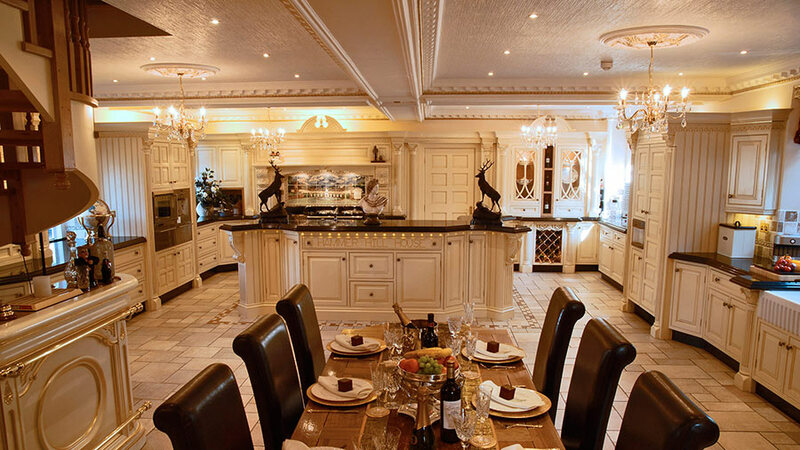 Luxury kitchens London or Bespoke kitchens London. 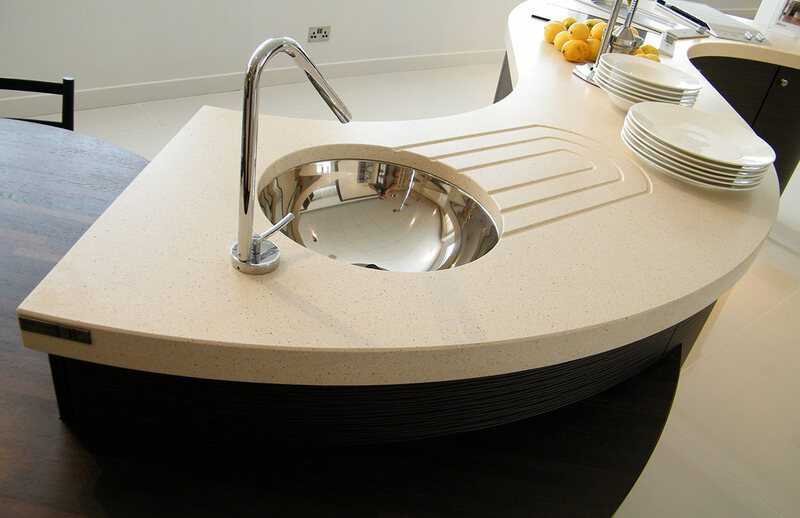 Kitchens in London or kitchen designers in London, or Kitchen company London. 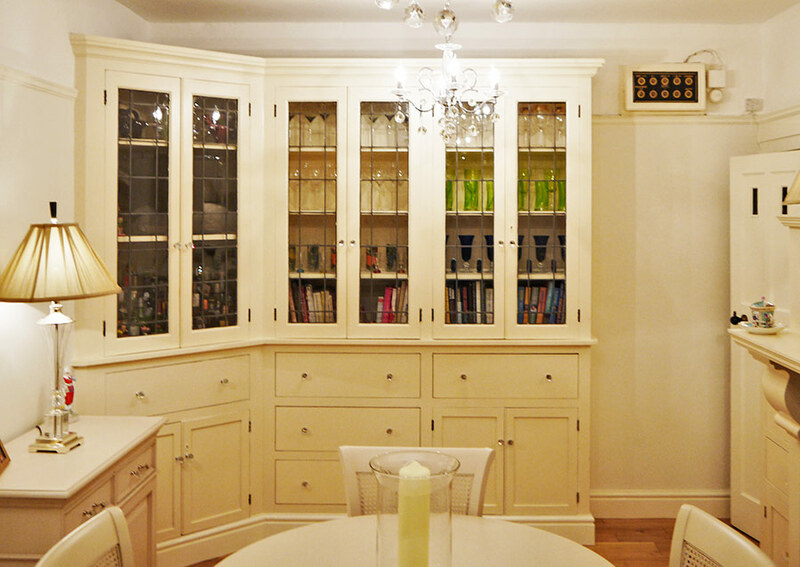 Handmade kitchens in London or Hand painted kitchens in London. Shaker kitchens in London or Classic kitchens London. 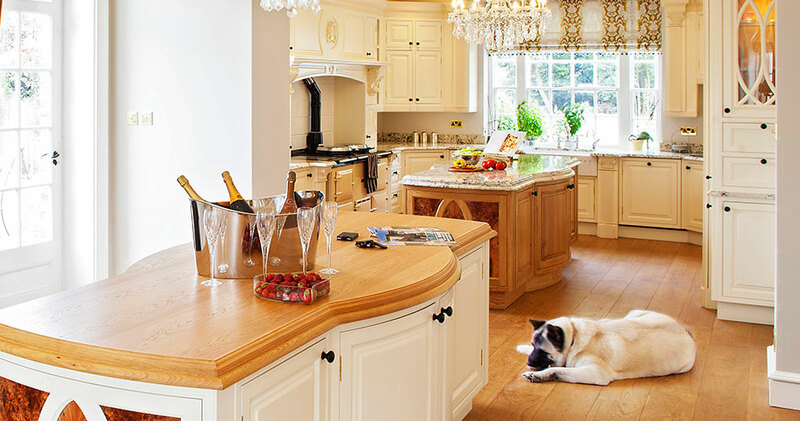 Traditional kitchens London, Edwardian kitchens London or Victorian Kitchens in London. Regency style kitchen designs London or indeed Georgian Kitchens London. 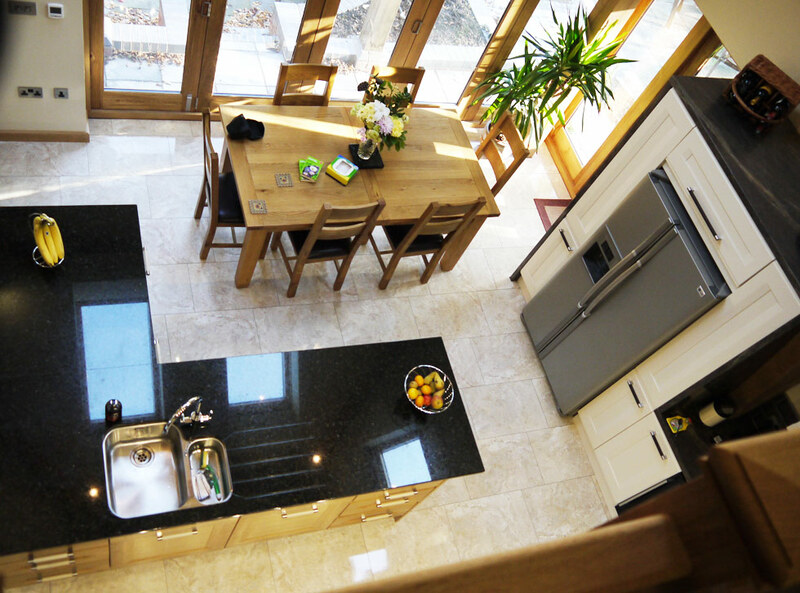 Modern Kitchens London or Designer kitchens London. If you live in London and are thinking of having a new kitchen designed and installed – bespoke kitchens, traditional kitchens or modern kitchens – give us a call, we look forward to hearing from you. Alternatively visit one of our kitchen showrooms - ideally let us know you are coming first so we can set aside some quality time for you.